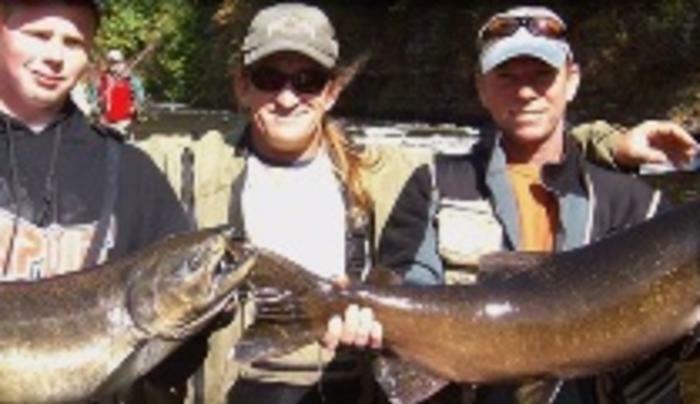 We specialize in fishing Lake Ontario for salmon, steelhead, brown trout and lake trout. All of are captains have many years of experiance fishing Lake Ontario. April, May June & early July the target fish is Brown Trout there may be some salmon & steelhead mixed in the catch on ocasion you may catch a Waleye or Atlantic Salmon. Mid-July thru mid-Sept. the target fish will be salmon, about the third week in Sept. most captains will start river fishing or night fishing the mouth of the salmon river for salmon. In the months of May & June there are some captains that will target walleye, most of this fishing will be done out of a smaller boat or a drift boat. Six hour trips are preferred if the fishing is good time may always be added, if the captain has time available. Four & eight hour trips can also be scheduled. Whether it is a once in a lifetime fishing trip or a family cruise around the lake, Lake Ontario Fishing Trips are here for you.